Michael Pollan is a food writer who doesn’t mince words. 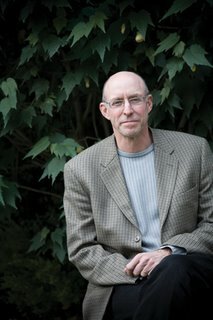 As a journalism professor at UC Berkeley and author of five books on food production, including the best sellers The Botany of Desire: A Plant’s-Eye View of the World and The Omnivore’s Dilemma: A Natural History of Four Meals, the Berkeley resident offers food for thought on agriculture in America. If I knew what you know about America’s food sources, would I be too grossed out to eat? Some people have read my accounts of these journeys along the food chain and they’ve become vegetarians. It didn’t have that effect on me, but it changed the way I eat. I really can’t eat fast-food hamburgers, and you know what I really can’t stand? Your basic cheap eggs. Because they come from unhappy chickens? They come from battery cage operations. The way they raise [chickens for] eggs is really brutal and kind of disgusting. What got you started writing about the beef industry? Harris Ranch on Interstate 5: I’ve passed that place and thought, “My God, this is how we raise beef in this country?” I don’t know how you could drive through that—that stench and that scene and say, “Boy, I really feel like a steak right now.” But lots of people do. It’s apparently a very successful restaurant. But you still enjoy a good cut of meat every now and then? I’m happy to eat grass-finished beef and pasture chickens. Berkeley Bowl has Panorama grass-fed beef, Estancia (from Uruguay), and then there’s the local Marin Sun Farms, which you’ll see on menus and [their meats, poultry and eggs are] available at the Ferry Building farmers market. We’re very lucky that there are very good alternatives in the Bay Area. Niman Ranch pork is a very sustainable product. I’ve been to the farms in Iowa where that’s grown. They live outside, they farrow; they have their babies outside in these little huts instead of these brutal cages that are just a little bigger than their own bodies. What struck you most in your travels across America? The landscape in Iowa in April was very striking. It’s black. There’s nothing green there because all of it is corn and soybeans. And they don’t get planted till late spring, so before that it’s just naked soil. There are no horses anymore, no meadows, no chickens, no orchards—corn has just taken over this landscape. It’s a monoculture, and monocultures are striking landscapes, for as far as you can see—the same thing. It’s very dreary. You’re a wordsmith, and your wife, Judith Belzer, is a noted nature painter. You must be drawn to one another, pardon the pun. There’s a lot of cross-fertilization that goes on in our work. A normal workday is, I’m writing upstairs, she’s painting downstairs, and we meet for lunch and grunt at one another because we’re too absorbed in what we’re doing. But there always comes a time when she reads what I’m writing and I look at her paintings.